Why Disk Booster over Windows Defrag? Not all defrag programs are the same or have the ability to defrag you drive in a single pass, or work silently in the background without interrupting your work or gaming. While Windows does include a defrag tool, its functionality is severely limited. Disk Booster provides outstanding performance to ensure your PC's hard disc space is optimized around your unique usage patterns and reclaim free space. 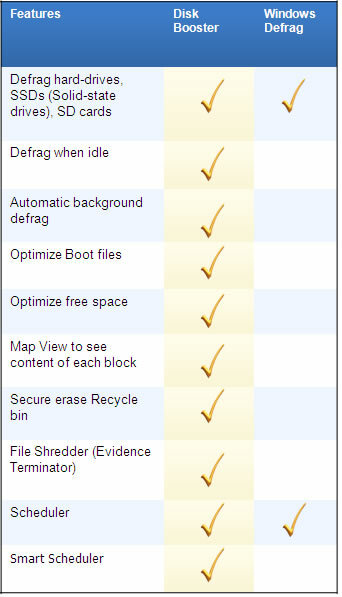 Windows defrag tools lacks the ability to organize your hard-disc and its optimize its content to prevent fragmentation before it happens. With Disk Booster's Fragshield, Windows boot files can be moved in one continuous block allowing faster boot-up of your PC. If you are in a hurry, Optimize Free Space, can move your free space into one continuous block, allowing fast read and write for demanding applications such as video editing, computer aided design, accounting and gaming. 3. Enjoy a Safer Computer! Microsoft and Windows are registered trademarks of Microsoft Corporation in the US and other countries. Intel is registered trademark of the Intel Corporation in the United states and other countries.